The holidays are about so much more than gifts; it’s about family, reflection, and being kids all over again. As that magical time of year approaches we reflect on those childhood memories that make the holidays so special. We may think of the beautiful displays at Rockefeller Center, the colorful Christmas lights that illuminate your neighbors’ window, or even the massive decorated trees in the center of your neighborhood mall. If you think about décor on this scale, bringing that magic into your own home can seem daunting and overwhelming. I want to show you how you can bring that same magic into your own home, the affordable way. Begin with the base material for your wreath. You can go to your local craft store and purchase the blank holiday greenery wreath, or you can create your own base and purchase a wreath form (in Styrofoam, straw, grapevine, or wire-clamp wreath form). You could base your wreath with peacock feathers or faux red roses… the sky is the limit. Be creative! When you’re actually thinking about the types of elements your wreath will contain, of course go for hydrangeas and Christmas bells… but why not mini soccer balls if your family is into sports or a long strand of faux pearls if you’re into jewelry? Throw in some faux fruit and berries, why not? The best wreaths have an element of the unexpected. Play with textures! You need some sparkly things, some ribbony things, some flowery things, and some Christmas-y things! It all works!!! Don’t forget the twist ties! Whether you use the floral wire, pipe cleaners, or trash-bag twist ties, make sure your ornaments will stay on! 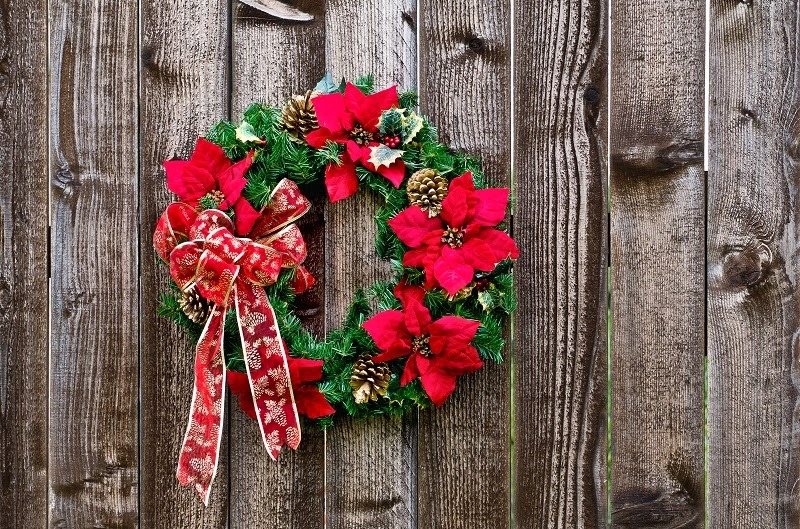 Especially if you plan on displaying your wreath on your front door, you need to be sure nothing will be falling off and breaking. Just because its holiday season doesn’t mean you have to pack up your lamps and vases for the next 2 months. Keep them there, but add some whimsical holiday magic. Hang some large bulbs on your lamps and chandeliers. Put a little faux snow on your bookshelf. 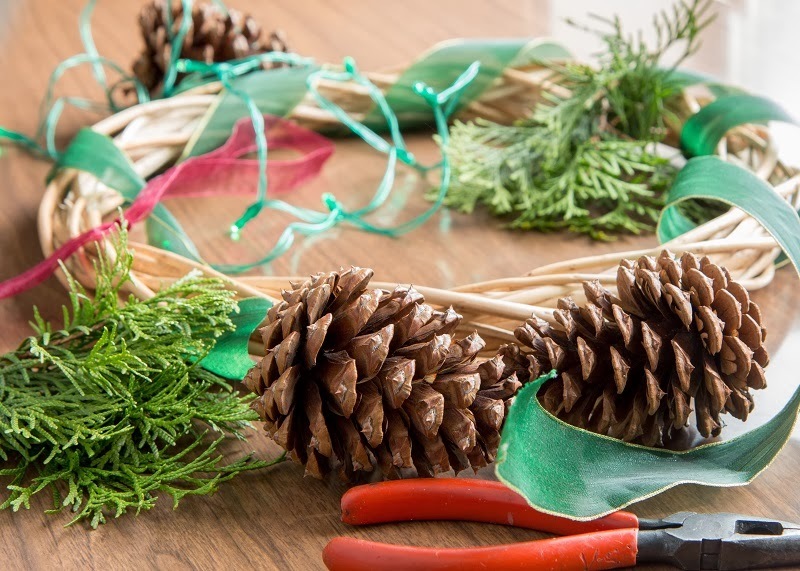 Change out the flowers in your vase for some pine cones. Tie up a bundle of cinnamon sticks and put that in your guest bathroom. When I think of holiday décor I think of not just bright colorful lights, but the smell of apple cinnamon and the sounds of holiday jazz. 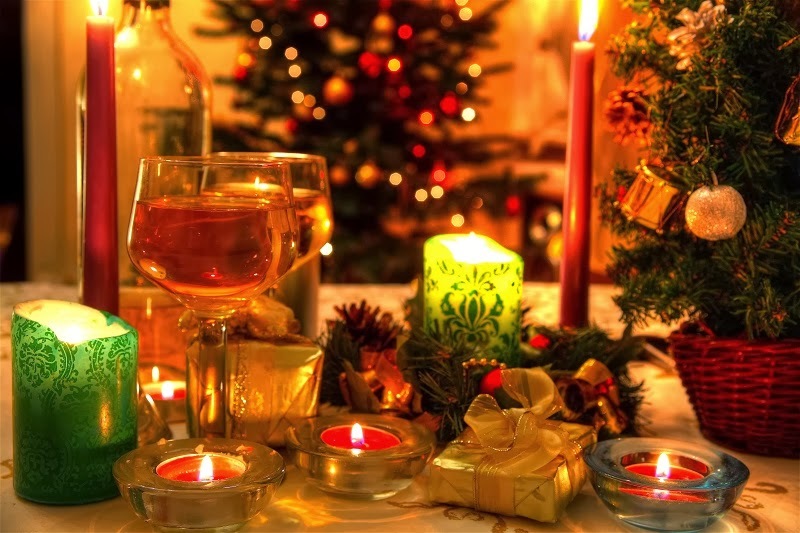 Don’t forget this holiday season to light some candles with your favorite wintery scents, and play your favorite holiday music while you’re around the house. Nothing else will get you more in the holiday spirit. hours to transforming your space. The magic of the holiday season you remember when you were a kid, doesn’t have to end when you’re an adult. Be creative, frugal, and have fun. Your home is your sanctuary, and there’s no better place to enjoy this holiday season than right there at home with the people you love the most.